A fisherman in Alaska took home a catch for the ages in June when he reeled in a 40-pound shortraker rockfish that experts believe is at least 200 years old. The Daily Sitka Sentinel reported that Henry Liebman of Seattle was deep-sea fishing off the coast of Alaska on June 21 when he hooked the record-setting shortraker fish from a depth of approximately 900 feet. “I knew it was abnormally big (but I) didn’t know it was a record until on the way back we looked in the Alaska guide book that was on the boat,” Liebman told the paper. Shortrakers, which have hues of orange, pink or red on top of their white bodies, are one of the most commonly sought fish in Alaska and can live at depths of more than 2,500 feet. However, a previously caught rougheye rockfish, similar to the shortraker rockfish, was believed to have been 205 years old. Still, Tydingco said that record-setting fish “was quite a bit smaller” than the 41-inch specimen Liebman caught. 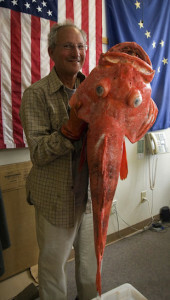 In 2007, a commercial fisherman caught a similarly sized rockfish that turned out to be 115 years old. Scientists say they still don’t fully understand animal longevity. Normally, smaller animals tend to outlive larger ones, though that does not necessarily appear to be true with the rockfish. Dressed in multi-coloured uniforms the tough jail inmates made all the right moves to dance their way into the record books. 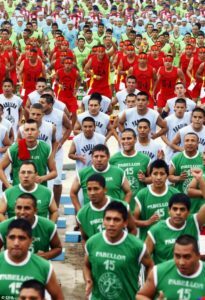 At least 1,200 prisoners in Peru’s notorious Lurigancho jail beat the world record for working out at the same time in the yard. Among them were armed robbers, hitmen, drug kingpins and petty thieves, but they all joined together to perform an aerobic ‘full body’ dancing show. Using small gaudily-painted wooden platforms, they practiced for more than three months and danced to rock music and reggaton – a mix of hip-hop and reggae. The men, from Peru, Venezuela, Ecuador and Colombia, are all inmates at the high security jail on the outskirts of Lima. Lurigancho was originally built to hold 2,500 prisoners, but there are now 7,000 inmates behind its crumbling walls, by far the most overcrowded jail in Peru. Conditions are appalling throughout the country, with reportedly just 63 doctors and one psychiatrist treating Peru’s 49,000 prisoners. Most are Peruvians but there are some foreigners, many convicted of acting as cocaine couriers. Cooking is done on small gas stoves and the prison population is deafened by old stereos and TV sets switched up to full volume. Inmates can freely roam the grounds from 6am to 6pm and although there are many police checks, each cell wing has its own security run by prisoners. In a prison courtyard there is a prison ‘market’, where convicts sell fresh fruit and vegetables, used clothes and pirate DVDs. One even illegally rents out cellphones. From Yahoo News and British media outlet The Daily Mail.